Christy Jullien (’12) realized her love of hospitality at Conrad N. Hilton College of Hotel and Restaurant Management. As sales manager at House of Hough, a specialty linen rental company and Cougar 100 member, she works one-on-one with clients to create memorable events, and recently launched the new House of Hough video series where she showcases the newest designs and products offered. LUNAR COUGAR: Congratulations on your recent marriage to Louis Jullien (’10)! Can you tell us how UH factored into the engagement and wedding? CHRISTY JULLIEN: The engagement was a dream! Louis and I met at Cougar Grounds in the Hilton College during a Disney College Program Association meeting. We had both recently returned from “the most magical place on Earth” and found ourselves connected through the organization on campus. During a scavenger hunt proposal of reliving sweet memories, Cougar Grounds was the last stop and the place where he bent down on one knee. As proud graduates of UH and the coffee shop we hold so dearly, Louis and I knew that touches of red and white would be incorporated into our special day. 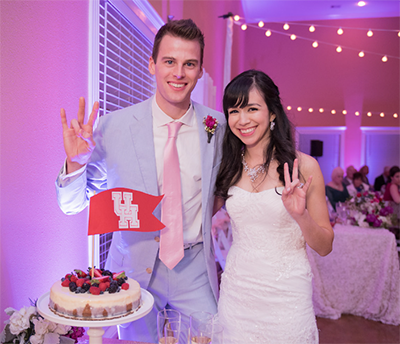 Amongst the springtime details for our outdoor ceremony, we also had a delicious cheesecake decorated with the UH emblem, I wore a UH garter, (specially handmade by my aunt and sister), and even served hot coffee in cute Cougar Grounds cups. How did you end up at Disney World, and what did you do there? I applied for the Disney College Program for the 2010 Spring semester, which essentially is an internship program where you are employed full-time at either Disneyworld or Disneyland. I had travelled to Orlando once before, and was captivated by the Disney experience. When I learned about the opportunity for employment there through UH, I knew it would be my ticket back. I was intrigued by the “behind the scenes” of how Disney does what they do, and how they are incredibly successful (if not, perfect!) at executing first class service to their guests. 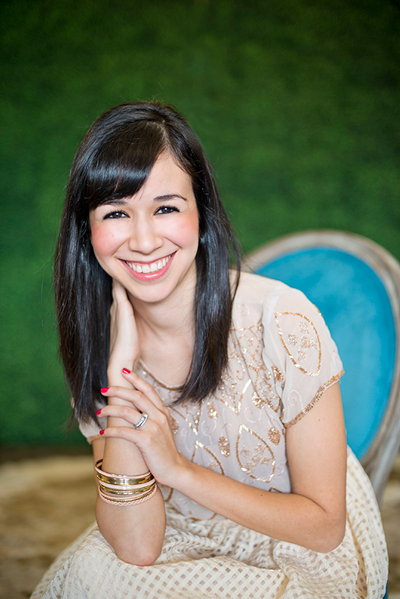 What do you do in your role as sales manager at House of Hough, and how do you use the skills you learned at UH? In my role of sales manager at House of Hough, I wear many hats! My main responsibility is to meet with brides and corporate clients when they visit our showroom for their linen consultation. We are able to meet with them one on one, guiding them throughout the wide selection of fabrics, colors, and textures in linens that will represent their overall style. Throughout the year, especially during the Bridal Extravaganza seasons, we as a team all come together to create new tablescapes and design the best showcase for our linens. This is one of the areas I really enjoy because it is an opportunity to challenge ourselves and invent trendsetting aesthetics. The Hilton College taught me the core principles that have stayed with me to this day. I learned the value and importance of networking by meeting students through on campus organizations, and was introduced to industry professionals who were already on the career path I planned to pursue. I appreciated the college for also teaching me “hands on” experience through labs and by incorporating a course where we were encouraged to hold a position of our choosing in the hospitality industry. This in turn helped me learn to balance both a full class schedule and several part-time jobs. Ultimately, my education at the Hilton provided me with opportunities to meet industry professionals who opened the door to job opportunities for me. What do you like best about working there, and in hospitality in general? What I love most about the hospitality industry is the fact that these skills can be taught to anyone who is willing to learn the ropes. More than just being nice to others, it’s the ability and the desire to genuinely care for your company’s clients in showing them the value of what your company offers. In my position at House of Hough, it is always exciting to invite a new hire into the company knowing that we have a unique culture and enthusiastic team who truly enjoy what we do day in and day out, and a group of people who have a vision for the future. Are you from Houston originally? Why did you choose to pursue your degree here? I am a proud Houstonian, born and raised. I love all that the city has to offer — whether it’s great food and dining, theater productions, museums, and entertainment in general — not to mention the culture, diversity, and the growth the city has seen in the last handful of years. Whether you’ve lived here your whole life or just moved here, there’s always something to do and somewhere to be! I always knew I wanted to stay in Houston for my college education. I am very close to my family and my sister, Patty (’07) had a wonderful experience during her studies at the C.T. Bauer College of Business. She was excited to have her younger and only sister also attend UH and become a Coog! I had heard many great facts about the University and knew it was preparing to see a lot of changes and growth. Also, who doesn’t love some Cougar football? How have you been involved with UH since graduation, and what is your impression of UH’s new initiatives and campus growth? Due to the fact that the owners of House of Hough, Clara (’02) and managing partner, Christopher Hough (’00), I’ve had the special opportunity to remain close to my UH ties right here in the office. The company was awarded “Cougar 100” for two consecutive years as one of the fastest- growing Cougar owned companies. I was also invited to participate in a speaking panel at the Hilton College by the NACE (National Association for Catering and Events) – Student Chapter and speak to students in this organization about my experiences both academically as well as professionally. Lastly, I think Renu Khator has been doing a remarkable job at growing the University of Houston. I’ve had so much fun attending social events on campus, as well as football games. The outstanding growth of the University makes me an even prouder alumna! If I haven’t emphasized this enough: network, network, network. You will meet people now who will be excited to help you down the road!